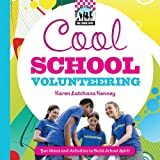 Cool school volunteering : [fun ideas and activities to build school spirit ]/ Karen Latchana Kenney. By: Kenney, Karen Latchana . What's cool about volunteering? -- Before you start -- The world of volunteering -- Tools & supplies -- Getting involved -- Come change lives with us! -- Teamwork time -- What's your thing? -- Group identity -- Organized by the super tutors -- Fund-raising -- Cutout cards -- Show your school spirit -- No-sweat sweatshirt -- Conclusion.